For the DDAS main meeting on the 5th December 2008 we were delighted to welcome Dr Chris Lintott of The Sky At Night to give his talk entitled Bang! – The Complete History of the Universe. Chris first appeared on The Sky At Night in 2000 and is now is co-presenter with Patrick Moore. He studied Natural Sciences at Magdalene College Cambridge, and has completed a PhD in Astrophysics at University College London. Chris is currently a Postdoctoral Researcher (and Somerville Junior Research Fellow) at Oxford University and his research interests are astrochemistry and star formation, particularly in high-redshift star forming systems. Dr Lintott is a Fellow of the Royal Astronomical Society and is also co-author of the book Bang! – The Complete History of the Universe with Patrick Moore and Queen guitarist Brian May. Special thanks to DDAS Vice Chair Chris Newsome for getting Dr Lintott to come and speak to us. 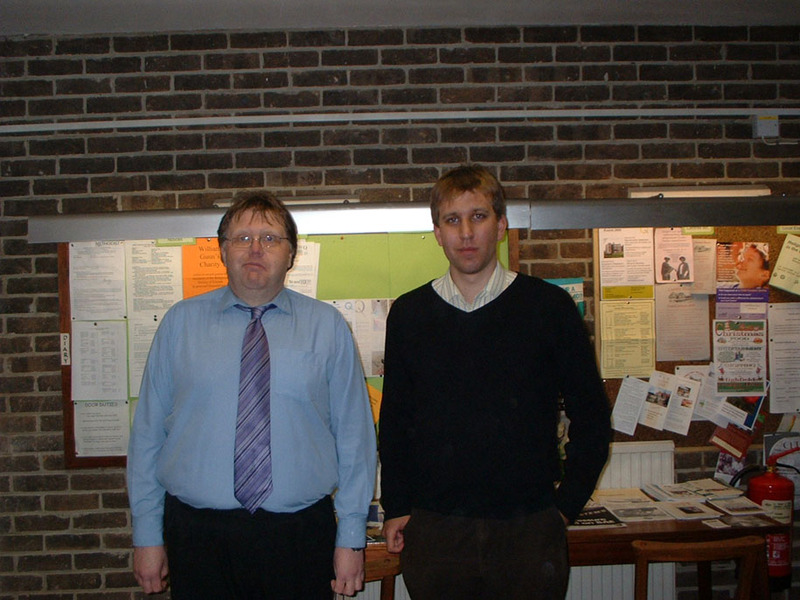 DDAS Chairman Anthony Southwell (left) with Dr Chris Lintott at the meeting on 5th December 2008. Picture by Chris Newsome.